My favorite woodie in the world! A nice sized drop, an awesome double helix, and as you go down the second drop, watch how everyone with their hands puts them right down, making sure they leave the ride with all of their limbs attached! There is also a great tunnel near the end of the ride, that really can distort you, with the strobe lights and everything. 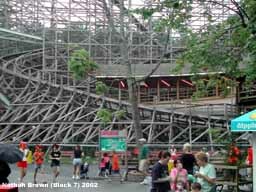 If you go to Knoebels, you absolutely must, ride this coaster! One of my favorite wooden coaster. While lacking the airtime Phoenix has, it does have a strong pop of it if your sitting in the front at the crest of the 2nd hill, as well as a few pops of it in other spots. Its totally exhiliarating from start to finish, and it has an awesome double helix. Another winner for Knoebels! I needed to change this. Ok, first off, I have gone on it a number of times since my last review, and it has only gotten better. Absolutley WONDERFUL ride. 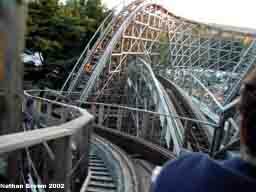 I love the double lift hill, and one of my favorite parts is wait for the cars to detach on the VERY top, and you can look out over Knoebels at EVERYTHING. I heard tell this was the highest ride at Knoebels, and I think theyre right. Absolutely AMAZING ride. I give it my full recommendation . 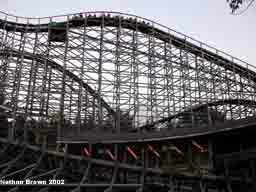 Great example of new age wood coaster with banked turns and relentless pacing. Leaves you thirsty for another ride. The ride suffers from inconsistancy. I got several terrific rides and some lackluster rides also on my three day visit. 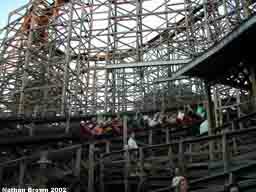 Its definetly fun and worth a visit to Knoebels and I thank them for building a rare twister experience and a thrilling one at that. Best twister! Wish we had a wooden coaster in Las Vegas! The look alone of this coaster is awesome, it sits in its own little section of the park, and when you come to the coaster, you find that the staion sits inside this huge double helix. It rides a little rough, as any good coaster should, and has an excelent layout, crossing over itself more then times then you can count (the actual number is 32), it is fast from the lift hill to the staion, and just try to hold you hands up with all the headchoppers on this one. I also love the tunnel at the end of the ride, and the design of not only the outside, but also the insde of the station is very nice (Ive spent plenty of thime in there waiting for trains). Make sure you ride at night, this coaster really comes alive then. 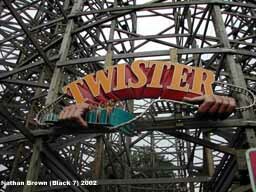 Twister is defininitly the best wood twister out there. The speed is amazing, and the head-choppers are AWESOME. The turns that come around the station in a sort of double helix is really fun. Not as good as the Phoenix, but it is a top notch ride. It is also the most expensive ride in the park, but it deserves to be. Come ride it! This coaster gives me a full appreciation for John Allen. I love the design of the ride and how it keeps moving. Im really glad Knoebels saved this ride and gave it new life.